The recession and tepid recovery have erased two decades of African American wealth gains. Nationally, the net worth of the typical African American family declined by one-third between 2010 and 2013…. 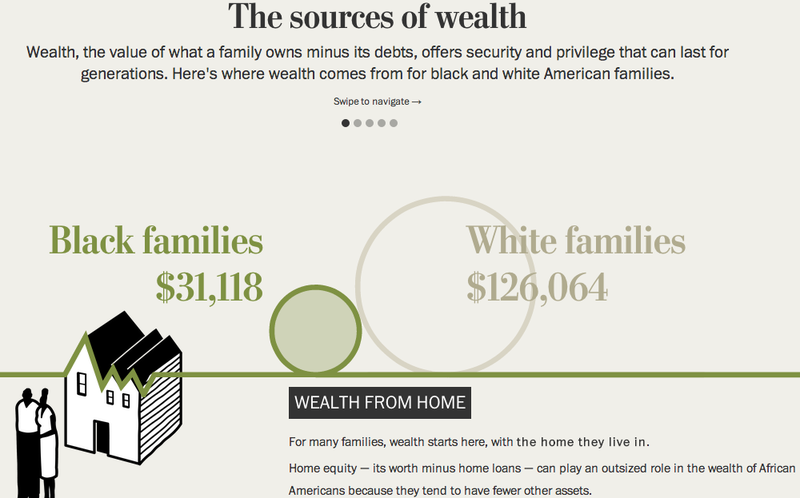 Overall, the survey found, the typical African American family was left with about eight cents for every dollar of wealth held by whites…. And the only obvious way to rebuild this wealth in the short to medium term is to raise property values in black neighborhoods. Which, whether or not that’s accompanied by racial change, is likely to price some renters and prospective buyers out. This is not a “gentrification is clearly good, so stop complaining” argument. According to the Post story, only 43% of black Americans own their own home, so even strong gains in to property values would only go so far. But the issue of wealth deserves a more central place in the story of changing real estate values, and anyone whose knee-jerk reaction is to condemn rising home prices in non-white neighborhoods ought to have something to say about how else we can close the wealth gap. Previous Previous post: How many carless workers are there in Chicago? Interesting series, look forward to seeing how you and Pete build on it. Bryant mortgage payment today: $3,900 / month, est. ~6% interest rate (depending on local property taxes, http://www.mortgagecalculator.org/). If they could refinance today, the going rate is ~3.75-4%, which would equal a payment of ~$2,600-$3,000. However, they likely cannot refinance because they now owe more than their home is worth. Put another way, they are effectively borrowing the max they can against the current value of their home (80% of $480) at the going rate (4%), and paying ~10% interest on the other $176K that they owe. Bryant mortgage payment at purchase: “~1/2 what it is today” = $1,950. That would imply a 30 yr fixed loan at ~4.5% on the original $336K minus the $20K down payment. The going rate in 2001 for a 30 yr fixed mortgage was ~7%! (Source: http://www.freddiemac.com/pmms/pmms30.htm). So even though it worked out for a while, at purchase the Bryant’s must’ve been borrowing on some sort of Adjustable Rate Mortgage, accepting the risk that their payments could go up and they could be priced out of the home they bought. Their second daughter, Jayla, was born in 2004, and not long after that they decided to send Harmony to private school. Later, Jayla followed her sister to private school. But the bills became a strain, even with the family’s income, which was well into six figures. With their home’s value rising, they took a home equity loan. Then after receiving a phone solicitation, they refinanced into an adjustable-rate mortgage that offered a teaser rate that gave them the option of making smaller monthly payments. Little did they know at the time, but that deal increased the size of their loan if, as was often the case, they made only the minimum monthly payment. Look millions of people made a bad bet on their home value (black and white). They all must accept some responsibility for that, but this is also very clearly an example of “predatory lending”. 1. The Bryant family was well educated, high earning, and claims to have attempted to approach the homebuying process responsibly. How do we make sure people like that make better (less risky) personal budgeting decisions? Especially related to housing which is such a huge swing factor? 2. Why were minorities disproportionately targeted for predatory lending? Answer: (Loan officers) “saw the black community as fertile ground for subprime mortgages, as working-class blacks were hungry to be a part of the nation’s home-owning mania”. They were also tragically and horrendously racist, commonly using terms like “ghetto” and “mud people”. Wells Fargo settled a lawsuit related to those actions for $175M. Where does the money go? For example, Baltimore is getting ~$60M of that. It will only go to the borrowers who would have qualified for prime loans but were steered toward subprime loans anyway (the Bryant family would not qualify). ~15K to ~4K homeowners (out of 34,000 minority borrowers attached to the suit). In my opinion, WF is getting off very easy here. 3. Why is Prince George’s county the #1 majority black county in the US ranked by household income? Are there success stories (lessons to evangelize) about generational income mobility, or educational attainment for minorities? Or is there some other drive involved? Thanks for this. I don’t feel like I have a great answer for #1. As for #3, that’s a good question. My impression is that DC has been a particularly strong black employment center in part because of the strong public sector, which tends to disproportionately employ black people – as opposed to cities like Chicago or Milwaukee, where the black middle class was built more heavily on industry, and suffered quite a bit more when those jobs left the country. But I’d also be curious about how much of a place like PGC’s economic status is about mobility, and how much is self-selection.